I’m a huge fan of double cleansing. I wear SPF every single day and make-up more often than not, so I like my skin to feel clean — but not stripped — before I go to bed. And although I’m willing to invest in good skincare when I can, if I can find a high-quality, cruelty-free product at a reasonable price, then I’m sold. An Australian brand, Sukin was created when its founders spotted a gap in the market for natural, reasonably priced skincare. Their tagline is ‘Skincare that doesn’t cost the earth’ and it sums up their philosophy perfectly. Everything is carbon neutral, affordable, cruelty-free, vegan, and made from lots of lovely, natural ingredients. There’s also a long list of ingredients Sukin won’t use, including parabens, preservatives, sulphates, mineral oils, artificial colours, synthetic fragrances, and propylene glycol. As you can imagine, I was very excited when the brand got in touch to ask if I’d be interested in testing out two of their cleansers. I chose the Cream Cleanser (for make-up removal) and the Oil Balancing Cleanser (as my second cleanse). I’ve been using them every day since the beginning of March, so I thought it was time to share whether these products are as good in real life as they are in theory. This is an ideal cream cleanser because it’s soothing but not too rich or heavy, and the water soluble formula means it’s easy to rinse off with a flannel. It’s pretty good at removing make-up, although I sometimes have to use it twice if I’ve been wearing particularly heavy eyeliner. It’s the first product I use in the evening, and sometimes I’ll use it in the morning if my skin is feeling drier than normal. The key ingredients are rose hip, avocado, and wheatgerm oils, with aloe vera, horsetail and nettle to refresh the skin. My skin always seems to respond well to rose hip oil in particular and this occasion is no different — my complexion looks a little brighter and healthier after use. The creaminess comes from cocoa butter and shea butter, which hasn’t caused my skin any problems, but I know some people can get congestion caused by these ingredients so it’s something to bear in mind. But overall I’m really happy with the Cream Cleanser and I’ll be buying a bottle when this one runs out. When you have combination skin, finding a second cleanser that isn’t too heavy or too harsh can be a challenge to say the least. Luckily, this one, a black gel, gets it just about right. Although it does contain ingredients (moringa and coconut) that are supposed to target spots, it also contains chamomile, aloe vera, and cucumber to calm the skin. The bamboo charcoal is meant to balance oil levels and I think it does because my oily patches, although still present, aren’t quite as intense as they used to be. One thing I will say is that this cleanser is very, very foamy — proof that you don’t need sulphates to create a satisfying lather. But there’s so much foam that you have to spend a lot of time rinsing to make sure all traces of product are gone. 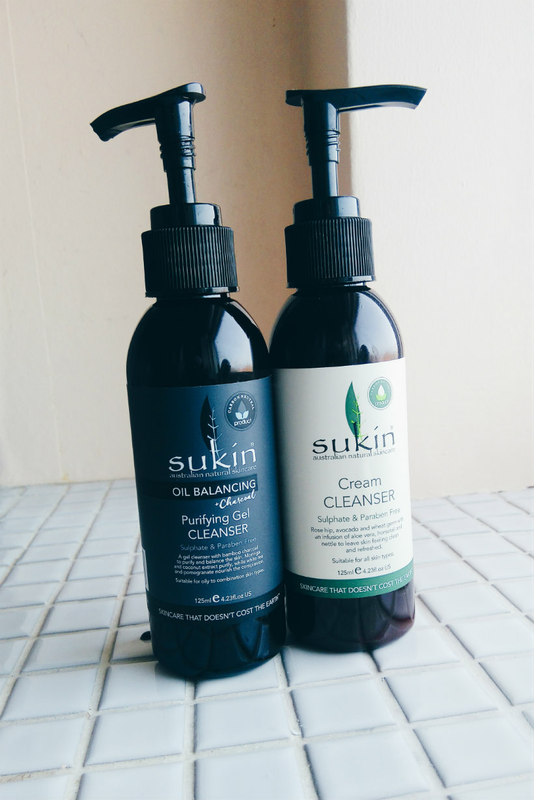 I’ve enjoyed using these cleansers so much that I went out and bought one of Sukin’s moisturisers as well! There are plenty of products to choose from, for all skin types, and you can find them online or in Boots stores, so they’re really easy to get hold of. Have you tried anything from Sukin before? What do you look for in a cleanser? Let me know in the comments! This post contains affiliate links. Products were to sent to me for consideration of review. As always, all words and opinions are my own.